I changed the name of a database in Microsoft Sql Server 2005. The database happened to be the default database for a user. The next time the user tried to connect to the SQL server instance, they received the following error message: Cannot Open User Default Database. Here is the fix. Note InstanceName is a placeholder for the name of the SQL Server 2005 instance to which you are connecting. SQLLogin is a placeholder for the SQL Server login whose default database has been dropped. Password is a placeholder for the SQL Server login password. Note AvailDBName is a placeholder for the name of the existing database that can be accessed by the SQL Server login in the instance. At the sqlcmd prompt, type GO, and then press ENTER. Custom Sort from Andy Warren. How to get United States to appear first in a drop down list of countries. I was having trouble parsing an Update query that was using an inner join. It turned out that I was missing the From clause in my update statement. 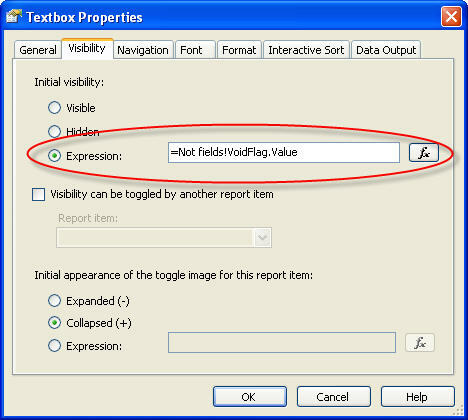 Open Textbox properties Dialaog box, click on Visibility tab, and enter =Not fields!VoidFlag.Value in the Expression box. I was setting up security for general users on a production Microsoft SQL database. The security configuration needed to allow the users to execute stored procedures called from a WPF application. Here are the steps I took using Windows Authentication. 1) At the database security level, I did not assign the users to any specific database roles, so the users, by default, were assigned to the public database role, which provides minimum permissions and privileges. I subsequently found other ways to grant Exec privileges through the creation of a db_executor role.